Pure Magic or just an Illusion? The existence of a mysterious, elite group known as the Majestic 12 has always been doubted. Declared by some commentators as outright fakery, the Majestic 12 papers have also been promoted as genuine by others whilst, by using somewhat convoluted justifications, some more ingenious and imaginative researchers have suggested that they are a mixture of both truth and lies. Of one thing we can be certain. Having become aware of an impending threat from an “alien” culture, the U.S. Administration did create a top secret 12 man panel with a remit to determine the intentions of this “alien force” and to monitor its progress. Totally autonomous, this 12 man group worked at a level of absolute secrecy whilst attempting to quantify the development of a force that would prove, at times, to place no value on human life. Whilst the citizens of the U.S.A. slept peacefully in their beds, travelled to work, carried out their duties and enjoyed their leisure, this small elite group was covertly attempting to quantify a massive threat which they knew, sooner or later, could potentially fill the U.S. skies with fire and spatter the Earth with death and destruction. The Majestic 12 revelations were accompanied by horrific reports of human experimentation and of underground bases where human beings were subjected to incredible cruelty and often reduced to slavery. In fact, little did the 12 man panel realise but this would eventually prove to happen – in real life. It must have been impossible to comprehend that human beings would be subjected to slavery, starvation, human life would be valued as nothing and ordinary people would be regarded as inferior by an inhuman, alien power. 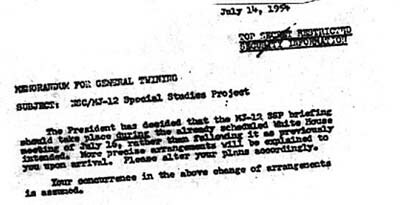 The belief that the Majestic 12 documents are genuine is still promoted by some researchers and claims of other projects which are derivatives of the Majestic group are continually being made. 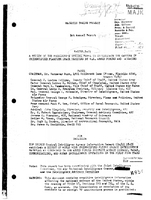 Whether the Majestic 12 papers are genuine or not we can all be certain that a 12 man group with very similar responsibilities was created to monitor a massive, impending threat - this group was not conceived in the late 1940s but ten years earlier, prior to the U.S.A.’s involvement in World War Two. Research into the history and personnel involved in the pre-war group of 12 is continuing and will be added to this website as soon as possible. On December 1984, Jaime Shandera, a Hollywood film producer who also has an interesting UFOs, received some unusual information via the post - a package containing just one roll of monochrome film. The package was posted in Albuquerque, New Mexico but had no return or senders address . There was no accompanying letter. Shandera had the film developed and was surprised to find negatives of what appeared to be an eight paged briefing paper dated 18th November 1952. The first page of this paper carried a warning " TOP-SECRET - EYES ONLY" and was for the attention of President Dwight D. Eisenhower. On page two was a list of twelve eminent US scientists, military leaders and intelligence advisors. On page three the subject of the paper was stated as the recovery of a crashed flying saucer and alien bodies near Roswell , New Mexico, in July 1947. The final page of the briefing paper was a memorandum from President Harry Truman to his secretary of defense, James Forrestal, instructing Forrestal to proceed with "Operation Majestic-12".This memorandum was dated 24th September 1947. The paper and the memorandum showed that in 1947 a flying disc-shaped craft crashed near Roswell and extra-terrestrial biological entities (EBEs) were recovered by the military - President Truman was authorizing Forrestal to set up a committee to deal with the situation. In 1952, newly elected President Eisenhower is then briefed about the situation by the papers - including details of the 12 man committee, the saucer crash and the need to avoid public panic. In 1985, researcher Bill Moore received a postcard, postmarked New Zealand, through the post advising him to search some recently de-classified files at the US National Archives. Along with Shandera, Moore did this and found a memo confirming the existence of MJ-12 (another name for Majestic-12 along with MAJIC), written by Eisenhower's Special Assistant for National Security, Robert Cutler, addressed to Nathan Twining - US Air Force Chief of Staff. The first contains brief instructions to General Nathan Twining (alleged MJ-12 member) regarding his activities during a trip to New Mexico in July 1947 - the site of a crashed UFO. 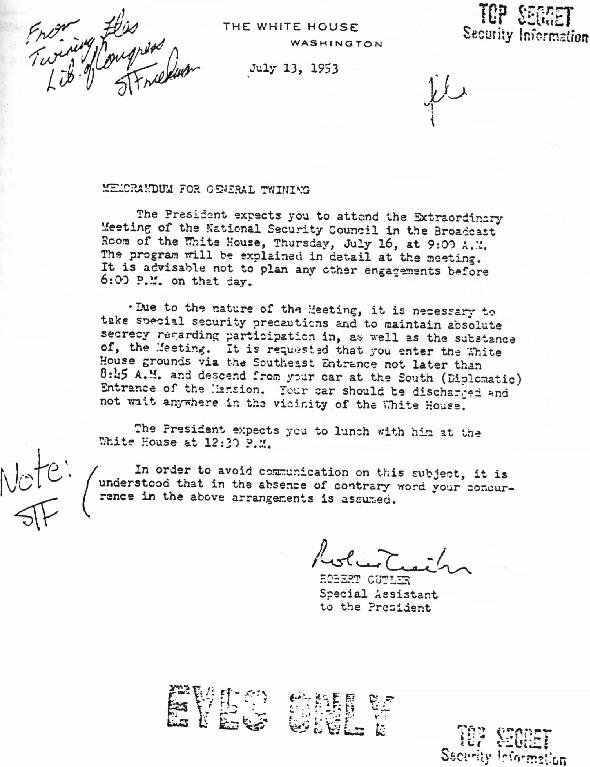 The second is memo, dictated by US Secretary of State to his secretary R.H. Humelsine, to President Truman - the reference at the top of the memo contains - "MAJIC EO 092447 MJ-12"
Then in 1994, UFO researcher Don Berliner received an anonymous roll of film containing 23 pages of a "Majestic-12 Special Operations Manual" - dated April 1954 - containing detailed instructions entitled " Extra-terrestrial Entices and Technology: Recovery and Disposal". 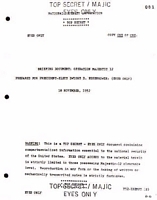 The original paper and ink of these documents cannot be analyzed because they are on film but the factual details can be checked - such as the background of the 12 members of MJ-12, dates and times and signatures etc.....The alleged members did , in deed, prove to be the cream of the US's Intelligence, Military and Scientific communities - exactly the people that could be expected to be members of a group investigating UFOs. The last surviving member of MJ-12 had died before Shandera received the original film but the activities, correspondence and telephone logs etc.... of the members could be investigated . The earliest reference to Majestic-12 is in the memo allegedly sent by Truman to Forrestal, names the president's science advisor, Vannevar Bush, and is dated 24th September 1947. Investigation shows that this was the only day between May and December that Truman met with Bush. After a great deal of research Stanton Friedman also proved that Forrestal also met with Bush - that day.
" The phenomenon reported is something real and not visionary or fictitious". Also, flight logs from 1947 show that Twining had flown to New Mexico on 7th July 1947 - according to the original paper this was the same day that " a secret operation was begun to assure recovery of the wreckage for scientific study". Genuine documents or hoaxes accompanied with several coincidences? There is a lot of disagreement by "experts". One of the main problems regarding the documents is the signature on the Truman document - it appears to wrongly positioned on the page and, when compared with an authentic signature, it appears to be almost exactly the same - inferring that it has been copied. James Forrestal - first U.S. Secretary of Defense, officially he committed suicide in the early hours of May 22nd, 1949 whilst in Bethesda Naval Hospital recovering from a nervous breakdown. However, the official account has been disputed - see below. Major General Montague - head of the Special Weapons Project at the Atomic Energy Commission in New Mexico. Nathan Twining - Commander of Air Materiel Command at Wright Field - later Chairman of the Joint Chiefs of Staff, the US's highest military position. President Eisenhower Was he briefed about Majestic-12 ? 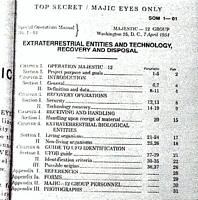 The Majestic-12 papers - genuine or hoax? Click on picture for larger size The Cutler-Twining memo - found in the US National Archive by UFOlogist Bill Moore after receiving a postcard (from New Zealand) telling him where it was hidden. Truman's signature on the Majestic-12 documents .Genuine or not? Document received on film by Jaime Shandera etc. Reputed to be the manual of instructions relating to the recovery and disposal of Extraterrestrial Entities and Technology. MJ 12 reputedly set up a special panel to deal with UFOs. Page one of the UFO Panel documents. James Forrestal - did he pay the price for opposing incredibly high levels of secrecy? 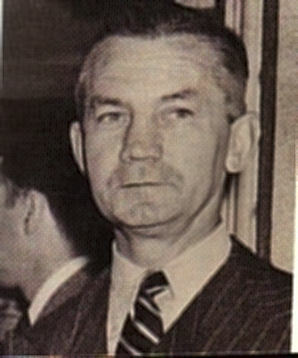 Following World War Two James Forrestal served as Secretary of the Navy under the Truman administration but subsequently was made Secretary of Defense. In this position Forrestal objected to the obsessive secrecy that was developing, especially by certain new departments such as the CIA. In fact he lobbied for the CIA to be brought under much tighter governmental control. His opposition to the high levels of secrecy caused him to attract the attention of those he opposed and when he voiced his objections to “being watched”, he was declared paranoid by those who were ignorant of the true facts. Forrestal was ordered to the mental ward of Bethesda Naval Hospital and was said to have suffered a nervous breakdown. He was isolated and discredited; even his family and friends were denied permission to visit him. On May 21st1949, Forrestal’s brother informed the authorities that he intended removing him form the hospital on the following day. In the early hours of 22nd May 1949, it was later announced, James Forrestal committed suicide. However, ex-Naval Intelligence Officer William Cooper maintains that James Forrestal was the victim of the people whose obsessive secrecy he opposed and some time on that fateful morning secret agents (CIA) entered his hospital room, tied a sheet around his neck and the other end to a room fixture. The agents then threw Forrestal out of the window, unfortunately the sheet could not sustain his weight and it tore and he plummeted to his death. James Forrestal’s secret diaries were confiscated, probably by the CIA.